Currently, I am sitting in bed in a mediocre motel room. I am over-tired, slightly stressed, and determined to stop Googling all my ridiculous worries that rise to the surface when life gets to be a bit too much. Really, life was more peaceful when I didn't have the answer to things right at my fingertips. Does anyone else occasionally feel nostalgic for the days when you had to go to the library to look something up? By the time you got there you frequently forgot what you were worried about and ended up researching some random bit of fascination like the weather in the Himalayas or the possibilities of a cross-Europe train journey. Now we have answers so quickly we don't have time to stop being worried, we just cascade into the next worry. And no, I have nothing really to worry about. But try telling that to my over-tired brain. 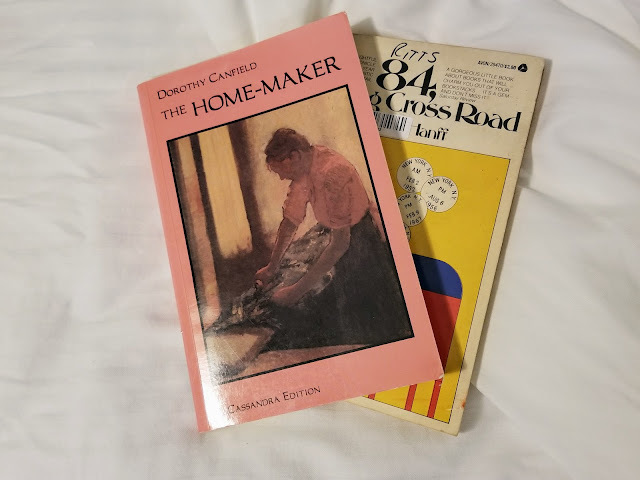 Currently, I am reading The Homemaker by Dorothy Canfield Fisher. I can tell already that I am going to have a lot of thoughts about this book. I actually set it aside for tonight because I want to really concentrate on it and did I mention the over-tired thing I have going on? So for the rest of this evening, I am reading 84, Charing Cross Road by Helene Hanff. I haven't read it in ages and there are few things as soothing as reading about someone who loves books. I bought this copy online and I am a little annoyed that someone wrote their name right across the top and that the seller stuck a sticker right on top of the author's name but for the price I paid I guess I can't complain too much. Currently, (well, not right this moment. I am in a motel but you know what I mean.) I am eating endless slices of toast and countless biscuits. I can't eat American wheat without getting migraines and digestive issues but I can eat wheat in the UK. I have no idea why. So the obvious thing to do was find a way to have UK wheat products delivered to me. Through the wonders of the internet, I now have five loaves of bread, sixteen packages of biscuits, more scones than any sane person needs, and bag after bag of flour. Not to mention the tea, chocolate, and Elderflower cordial I added to the order just because I could. You should have seen me when my very large parcel arrived. Now I just have to decide what to bake when I get back home. Victoria Sponge Cake maybe? It seems only appropriate to bake a quintessentially British cake with my British flour. Currently, I am very happy to have a new phone. My old one was getting a bit glitchy. I was content to put up with it until last week when the camera stopped working. That I am not willing to put up with. While I have a very nice fancy camera, I depend quite a bit on my phone for quick snaps while I am out and about. It was messing with my world not to have a camera on my phone. The kind man at the store took my old phone in trade, and I was able to get a new phone for me and a phone for my daughter without having to sell either of my children. Plus, I am now my daughter's favorite parent since she was convinced she was the only almost-twelve-year-old on earth who still didn't have a phone. Currently, I am feeling grateful that almost-twelve-year-olds seem to be basically indestructible. Celia was at a friend's house and didn't know that the bike she was using had faulty brakes. She lost control going down a hill, crossed a road, and went over the handlebars face first into a tree. She is banged up a bit and looks like she has been in a fight but is otherwise fine. It could have been much worse. The hysterical phone call I received, however, probably aged me ten years. Currently, I am wondering why everyone who walks through the corridor of this motel has to speak at the top of their voice. Didn't their mothers' ever teach them about indoor voices? Currently, I am thinking I might be slightly grumpy and that it is time to read 84, Charing Cross Road and dream of having my own Marks & Co. to fulfill all my bookish desires. So what is currently happening in your life? Interesting about the differences in wheat. I don't know why this is, but there was a good programme on BBC about a year ago called Victorian Bakers, which showed the changes in bakery over the century. One of the changes mentioned was that wheat nowadays has been bred to contain a lot more gluten, the sticky substance that holds dough together, as this makes baking easier. Perhaps this may be responsible for some gluten allergies? It is interesting. I wish I knew why I can eat wheat outside of the US. It sounds a bit crazy, but my friend's daughter also has a gluten intolerance and she can eat all the pasta she wants when they go to Italy. Food has changed a lot over the years. In many cases, it is much more processed. Maybe that contributes to problems as well. I can't wait to read your thoughts on The Home-maker. I have become more than a little obsessed with Dorothy Canfield's books, and that's the one that started it for me. I do believe that I purchased The Home-maker on your recommendation. I will definitely let you know what I think. I know just what you mean about instant access to information; it's brilliant in a lot of ways, but it can make us worry so much! I do hope you get some proper rest soon, though! And I hope your daughter continues to recover - that must have been awful for both of you! As for the British goods, well done for getting them. :) Could this be an opportunity to consult the Jane Austen cookbook? Not going to lie, that's exactly what I'd do! Or maybe just google Mary Berry recipes, which are always comforting and easy to follow. I think it is the perfect opportunity to consult the Jane Austen cookbook! I've got it on the coffee table next to me right now. It is. A bit of Britain at home. I hope your daughter heals up soon. I know what you mean about those loud voiced people in public spaces. If you like lemon flavour you should give lemon drizzle cake a go. That is an excellent cake suggestion. I am planning on making one this afternoon.